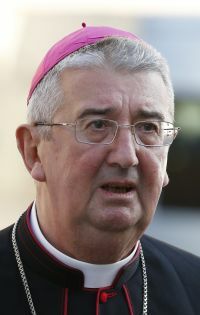 DUBLIN (CNS) — Archbishop Diarmuid Martin of Dublin said he would seek assurances from religious congregations operating in his diocese that they are rigidly following child protection guidelines after a fresh round of audits raised serious concerns. In a statement Feb. 10, Archbishop Martin said it was “appalling” that some major religious congregations had delayed fully implementing the church’s child protection guidelines and that, in some cases, this process only really got underway in 2013. The Irish church’s monitoring watchdog, the National Board for Safeguarding Children in the Catholic Church, published 16 reviews on the implementation of policies in religious congregations — eight male, eight female. She also said that, concerning seven of the male congregations, “there is considerable work to be done.” She was referring to the Franciscan Friars, Franciscan Brothers, the Servites, Passionists, Augustinians, Discalced Carmelites and the Marist Fathers. The safeguarding board was established in a bid to restore public confidence in the church’s handling of allegations of abuse against priests and religious after a series of judicial reports uncovered serious failings. Four Irish bishops have resigned following severe criticism of their failures in relation to handling allegations of abuse.